We are thankful for the media that seems to think that a cat stuck in a tree is breaking news. We are thankful for cell phones that constantly alert us to the important events of the day, such as a cat being stuck in a tree. We are thankful for commercials that tell us how easy it is to plan for retirement by simply buying the right product. We are thankful for the “Don’t Get Mad, Get E-Trade” commercials that seem to teach that the way to financial success is not by working hard but rather by trading stock on their platform. We are thankful for the recent pullback in the U.S. stock market so we have the ability to express our fear since greed has been the predominant emotion for the last few years. We are thankful for all the political ads, since we would not have known how to vote unless those commercials had given us their unbiased opinion on which candidate is the right one. We are thankful for the fact that in this political environment there is no middle ground whatsoever, making it easier to choose from just the extreme left or the extreme right. We are thankful, personally, for a teenage daughter who has alerted me to the fact that I dress like an old man and have less hair than I realized. We are thankful for the fact that The Finance Couple has a man who wears the pants in the family but a woman who tells him which pair of pants to wear. We are thankful that the food industry is looking out for our waistline (and not our finances) by minimizing the amount of food we get for the same amount of money previously spent. We are thankful for the holiday ads that started right after Halloween that tell us, contrary to our mistaken belief, that you actually should spend money on things you don’t need and can’t afford. We are thankful for Mr. and Mrs. Jones, who teach us the wisdom of living well beyond our means without worry for tomorrow. We are thankful for the fact that colleges and universities have increased their fees and tuition to unreasonable levels so we can learn that the more you pay for something the better it is. We are thankful that if you have nothing more than a heartbeat then you can take on any amount of debt to graduate from college without the knowledge that you may pay for it for the rest of your natural life. We are thankful for the current politically correct environment that prevents us from saying, or writing, things that might be offensive or painful even if it is what someone actually needs to hear. Ok, enough of the funny stuff. All kidding aside, in my short fifty years here on Earth I have learned that the more you are able to laugh at yourself and the world around you, the better the perspective you may have. In this crazy world of constant input from outside sources, we find it even more important to be able to step back, take a deep breath, and evaluate the world for how it is. And in our opinion, life is still pretty great here in the United States of America. Sure, there are some crazy and disconcerting issues in the U.S. and the rest of the world, but hasn’t that always been the case? The only difference now is that we are constantly bombarded by social media and other outlets that scream their opinion at us, hoping you forget that an opinion is inherently neither right nor wrong – it’s just an opinion. And if we lose sight of that, we may lose the ability to see the forest for the trees. As for the markets and the economy, it helps to keep a proper perspective here as well. Although a quick drop in the stock market can cause heartburn and fear, it’s best to remember that these periodic pullbacks can be a natural and healthy part of an ongoing bull market (just as a recession may not necessarily be such a bad thing but rather a pause to refresh or cool when an economy is overheating). Further, an increase in interest rates may be less detrimental than you think, and instead could simply be a return to historical, long term averages associated with a strong economy that does not need any further monetary stimulus. As for our perspective, although we do think the current environment is a bit too divisive, we choose to focus on the good things in life and remain thankful for what we have. 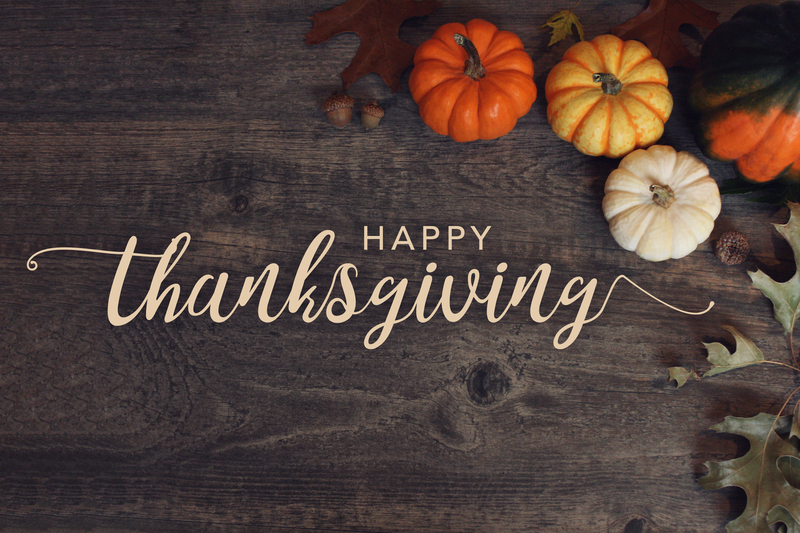 With no cynicism or sarcasm involved, we are truly thankful for your friendship and trust, and hope you have a wonderful and Happy Thanksgiving!